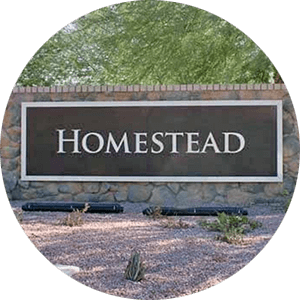 The Homestead community is located in the heart of Maricopa, on the corner of Smith Enke Rd & Porter, and holds over 2300 properties. There are currently new homes being built in Homestead (LGI Homes), ranging from 1,110 to 2,500 square feet. Homestead includes several parks, lakes, volleyball/basketball courts, and soccer/baseball fields. Homestead has its own fire department. The community is located close to local shopping, dining and entertainment.